> Interactive Intelligence > The Cloud-based Contact Center: Does it Make Sense for Your Business? Does a cloud-based contact center make sense for your business? 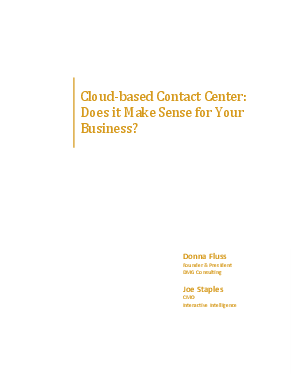 In this white paper, Donna Fluss from DMG Consulting LLC and Joe Staples, CMO of Interactive Intelligence go over the many questions about a cloud based contact center -- about deployment of cloud centers, the TCO's of owning a cloud based contact center and more.